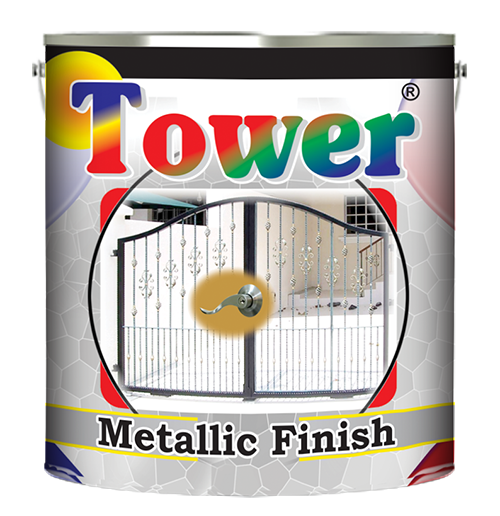 Tower Metallic Finish is an excellent quality paint suitable for use on all types of wood & metal surfaces, It gives smooth and lustrous finish. It gives protection against water, rust, heat and dust etc. New or previously painted surfaces must be clean, dry and free from grease, rust, dust etc. Rub down the surface with the help of abrasive paper. Apply Tower red oxide primer in order to prevent the surfaces from rust. When dry, rub down the surfaces with abrasive paper. Apply Honey Gold synthetic undercoat on the surfaces. After drying, rub down with the help of abrasive paper again. ApplyTower synthetic metallic enamel. Stir thoroughly before use..